Daisy Mug Rug/Coaster...I was inspired by the Pansy and decided to digitize my own Daisy...This was my test stitch-out...I think it turned out really well...It has a double layer of cotton batting and it is about 5" x 5.75". I have included photos of both the front and back...love that it is quilted through all the layers, too! 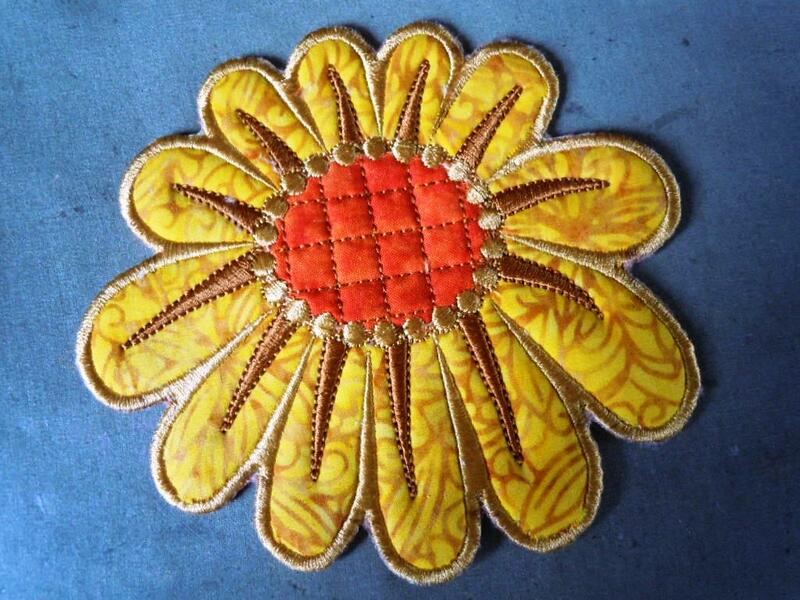 I used a tear-away stabilizer, but would probably use a WSS next time...there are a few tiny fuzzies from the tear-away...Edit: Added the second Daisy...Stitched delightfully well! These are gorgeous. Sure wish I had your talent. Wow, all are beautiful. Well done. This is beautiful. It would make a beautiful towel holder too! Wished I was an artist. Wished I could digitze. If wishes were worth a penny I'd be a billionaire. Just lovely Kim! These mugs rug are the most beautiful effect. I like them a lot. Excellent job. Kim, These are wonderful! I could see using pink fabric with a brown center to look like a purple coneflower.....wonderful idea! So charming, wonderful job on this. I'm so jealous of you talented ladies who can digitize for yourself. The daisies are great. Sometimes when I get those little tearaway pokies, I use a wet terry washcloth to rub them out. Yes I probably would use WSS too but the washcloth does work. I don't see any pokies on your. Well darn it, posted before I could get the s on yours. Hahahahaha, if I used a hot stencil cutter, I would have hot stenciled fingers. Very good idea. I love flowers! 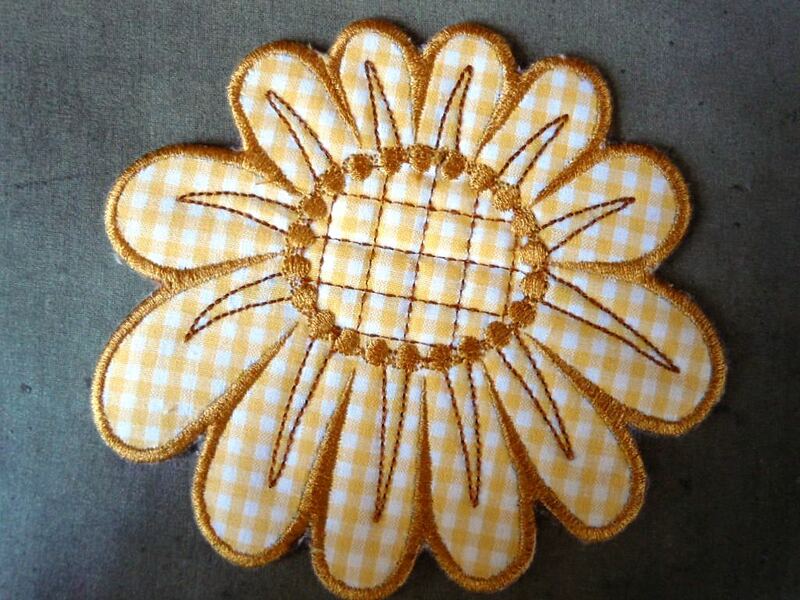 Very beautiful Daisy mug rug. Love it! Love these! You have an amazing creative mind! 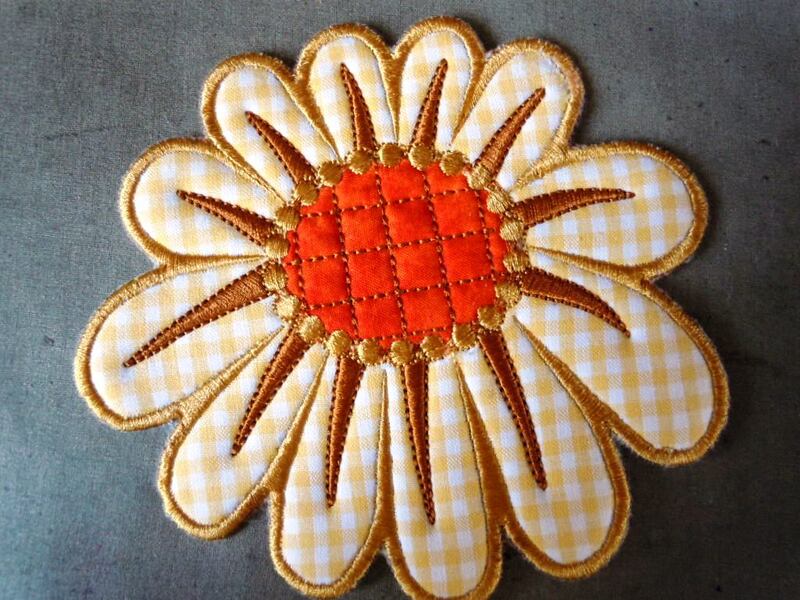 Love your daisy mug rug/coaster, it's beautiful! just beautiful !! I you did great to digitize it yourself, love the result !!! absolutely love it, you are one very clever lady. Love this, so pretty. Nice job. Thank you, Lillian...hope you are doing well! Excellent work Kim!! The daisy mug rugs are gorgeous, if you ever decide to sell the design (and the larger one when you've done it), I will definitely buy them! I love these, they are so cute! Great job Kim! 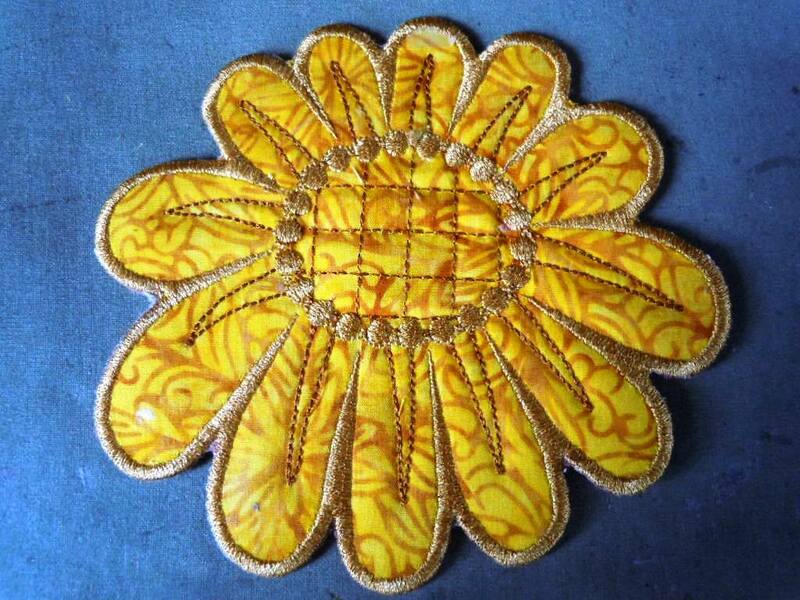 Oh My this is one great flower mug rug design. You are very talented. Like Shozo I too would have them everywhere...as I live in the country and on acreage I have plenty of places to sit and these would be a delight to have around in different colours...well done.. These are beautiful. I can also see them as hot pads on your table. Thanks Joyce...yes, me too...I am planning larger ones for the 8x8 hoop with Insul-Brite inside to protect the table from heat.. Hot pads would be so pretty! You create such beautiful things! Great, great work Kim. Love them a lot and I think the idea of scattering them around the house sounds great to me also. Beautiful flowers. I love them. Great Job. The look great. Love the Daisy mug-rugs. Do you sell your designs? I would love to have the mug-rug and make some for gifts. Very well done. They look so crisp and fresh. Wow! 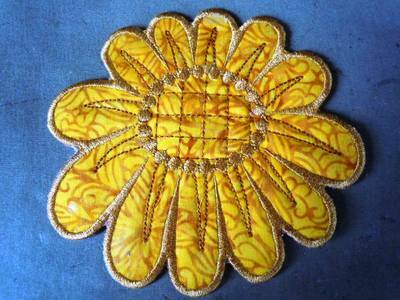 !This flower is Stunning...Great design and work you have done!!!! You are so funny, Carolyn...Thank you!